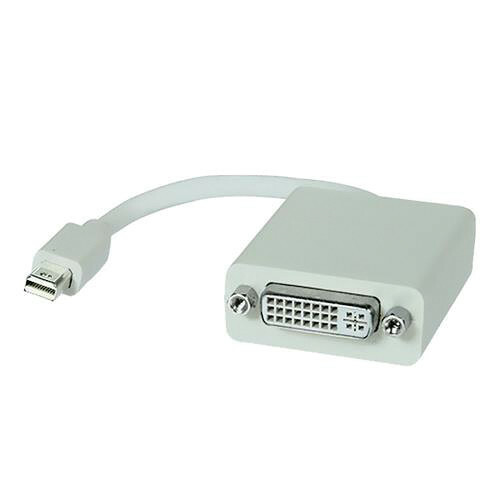 Comprehensive's Mini DisplayPort Male to DVI Female Active Adapter Cable is a 1' cable that allows you to connect a Mini DisplayPort source to a DVI display. This adapter supports resolutions up to 1920 x 1200, allowing you to take full advantage of a high definition display. Box Dimensions (LxWxH) 10.0 x 6.0 x 0.05"
Mini DisplayPort Male to DVI Female Active Adapter Cable (1') is rated 5.0 out of 5 by 1. Rated 5 out of 5 by Dead in the Water from Works with Mac OS 10.9.2 When attempting to connect more than 2 monitors to the new mac pro 2013 (trashcan model) only 2 passive monitor connectors can be used. This is an active connector that does work to add a 3rd or 4th monitor. Note there is a bug in Mac OS 10.9.3 that does not show the 3rd or 4th monitor. Apple is addresssing that issue :( But it does work in 10.9.2.